A value proposition statement is a short statement which clearly articulates the organisation’s target market, USP and customer benefits. We use them a lot as the process of crafting the statement helps clients focus their minds on who they are targeting and what the customer benefit is. There’s no need to spend hours agreeing every single word as value proposition statements are intended as an internal tool. They are generally used as the basis for your branding and marketing message development. I use proposition statements a lot in my work. My clients love them as they really bring their product or service to life. They are also useful as a workshop exercise – it’s great to get a team discussing specific words and phrases and ultimately agreeing on their shared marketing vision. We've held some great sessions where team dynamics have improved during the workshop as they craft their statement together. Who is the bullseye of your target market? We’re not excluding all others, but this statement should represent the best opportunity. The target market should be reachable, have identifiable and common needs and be profitable. For help in identifying your target market read our post explaining customer targeting. This allows the customer to understand what we are, who we are competing with and what aspects of their lives we are promising to improve. This is what our product does, it sets us apart from the crowd. A good USP is single-minded, unique and sustainable. For more information on USPs read this earlier post. This is the proof of the USP, it must be convincing and factual. This is often the hardest part to define. What is the ultimate customer benefit? It has to be motivating and relevant to the target market. 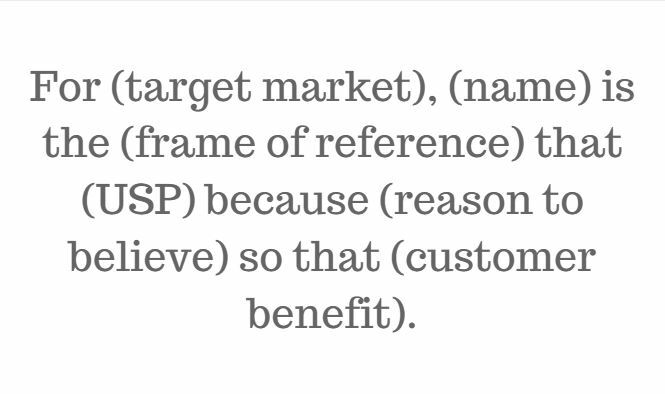 For (target market), (name) is the (frame of reference) that (USP) because (reason to believe) so that (customer benefit). You can have some fun with value proposition statements as they aren’t intended to be published. They are however used as the basis for marketing and communications messaging, so they need to be realistic. Here are some I created to illustrate how to put them together. For busy people, Amazon is the online merchant that always delivers the next day because our superior order processing means that you don’t have to wait. For stylish people, MINI is transportation device that makes every journey an adventure because we package a BMW engine into a smartly designed tiny package so that every journey is comfortable and fun. There are several other models of value proposition statements that can be used, but I like this one due to its simplicity and clarity. You can also develop separate value propositions for different products or services, and you should definitely have separate ones for each target market. What would your value proposition statement be? ⟵Which website lead tracking software is best?